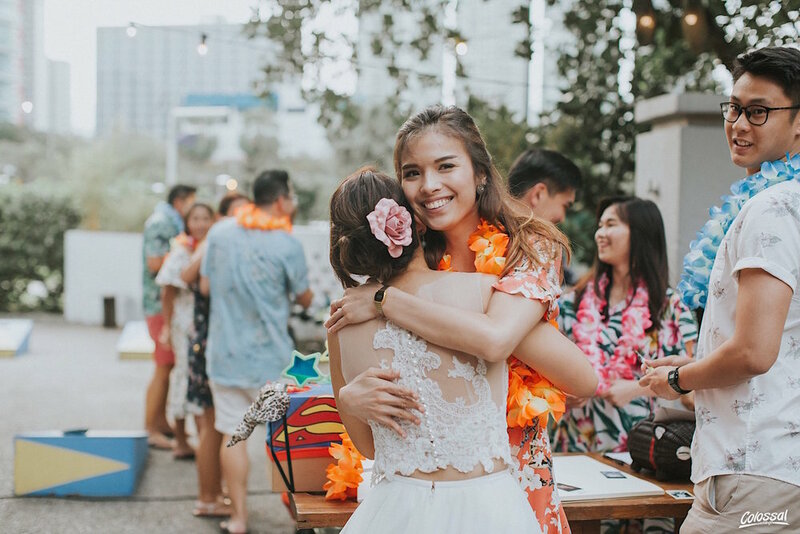 When it comes to wedding themes, we've seen quite a fair bit of couples who wanted a "simple" concept, but always ending up with logistic nightmares. 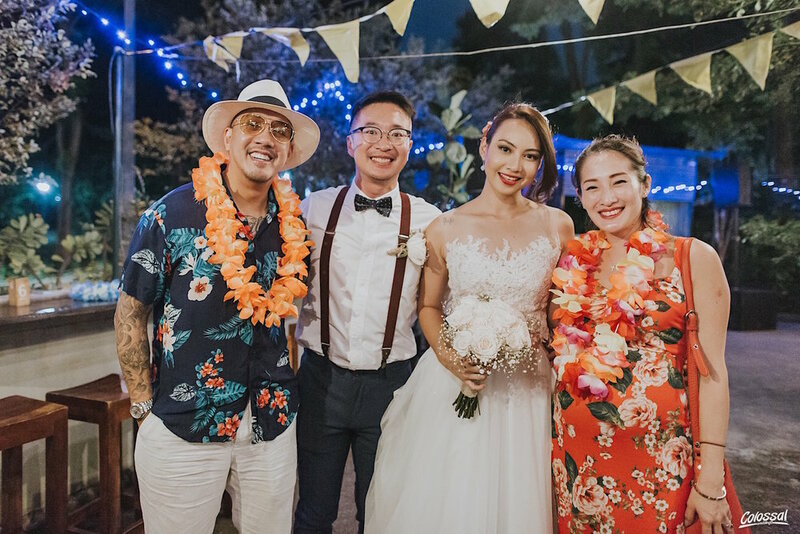 Not for Chanel and Martin, the photographer + model duo who met on a music video set (whom later we knew were a little shy the first time they met), pulled off the wedding of their dreams with the help of their closest. The celebration, with a relatively interesting Hawaii theme (oh yeah aloha!) 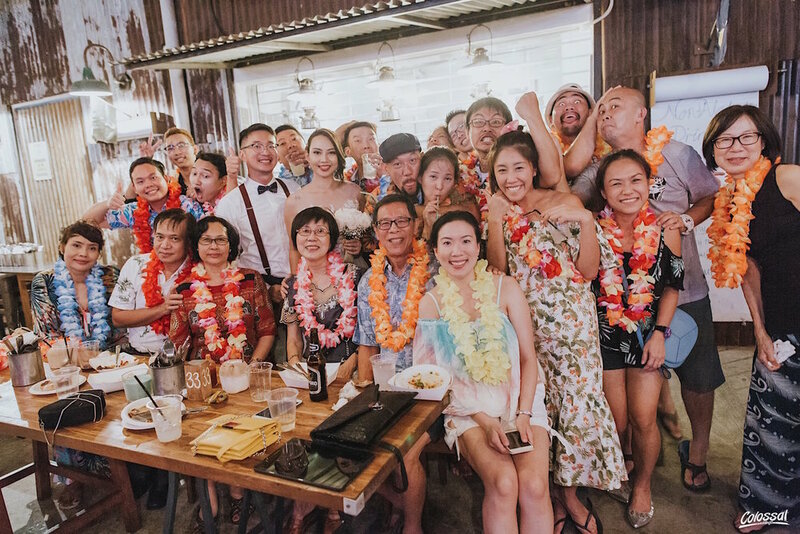 was definitely the epitome of what we call a "chill" wedding! So... how did the hawaiian theme come about? "We wanted something that matched our personalities, and we wanted it to be a celebration. I also wanted to be in flats and my guests to be in flats! I just wanted to be comfortable. I think food can only be enjoyed properly when you are comfortable. Another important point to us was that we didn't want our guests to worry about the ang pow, something low-key and fun was definitely always on our radar. We are glad we both share the same sentiment!" "My aim was to make everyone a walking decor. 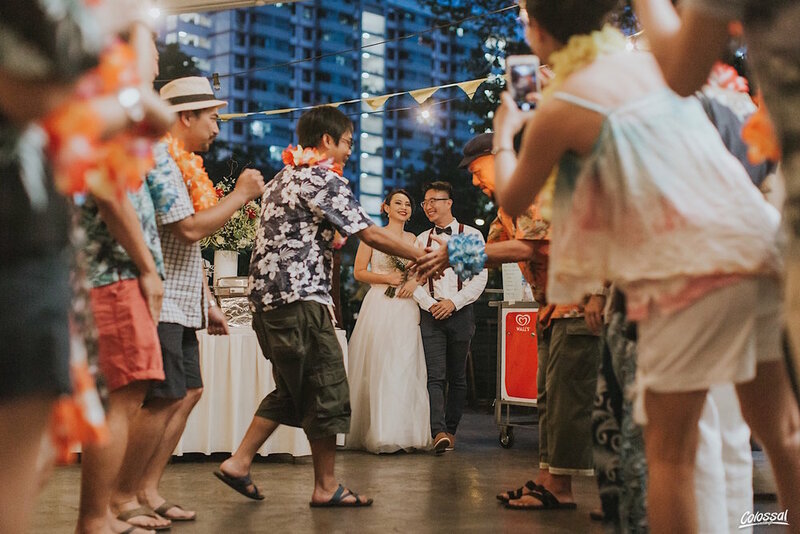 We got everyone flower garlands and ring pops as a door gift and told our guests to come in dressed in colourful clothes and flip flops!" 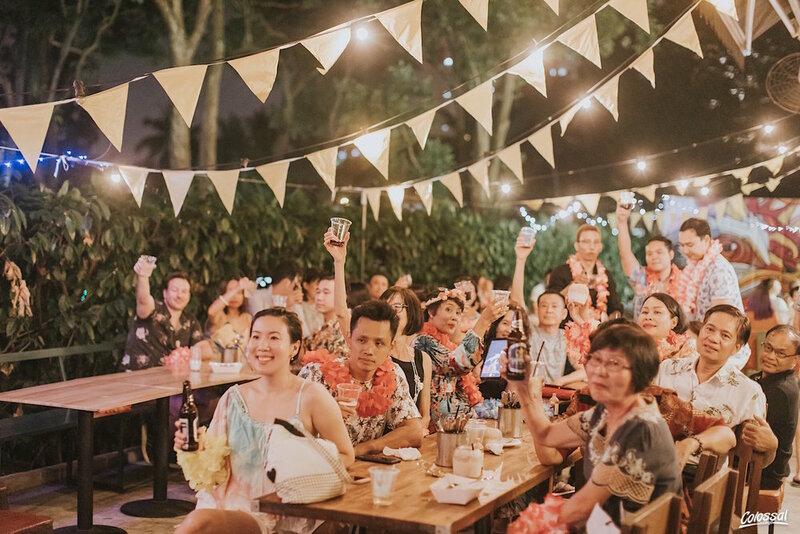 Seems like it's a wedding get-together + party! There must be some requirements for the wedding dress then! 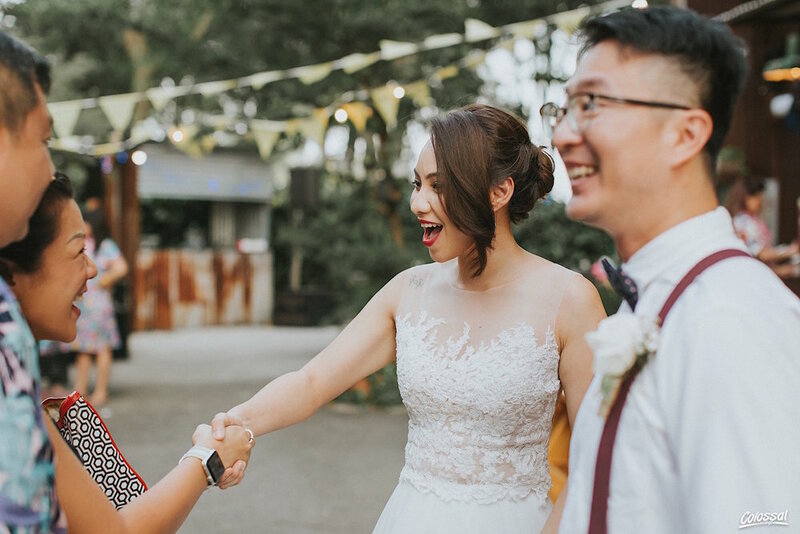 "I only started looking at bride dresses for the fun of it around my mid 20s or so and I would always send pictures of two-pieces to my close friends (hence the eventual choice of a two-piece gown!). 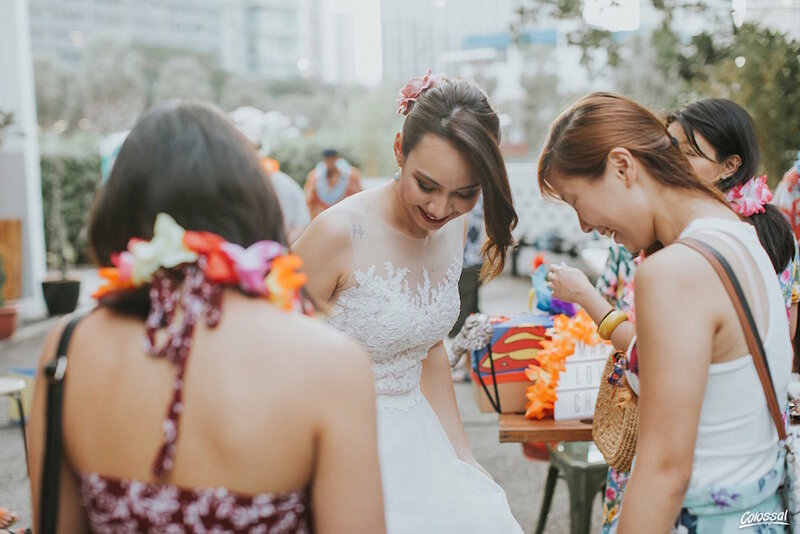 I always wanted something chic and something easy to move around in, I also always knew I would be wearing flats on my wedding day. 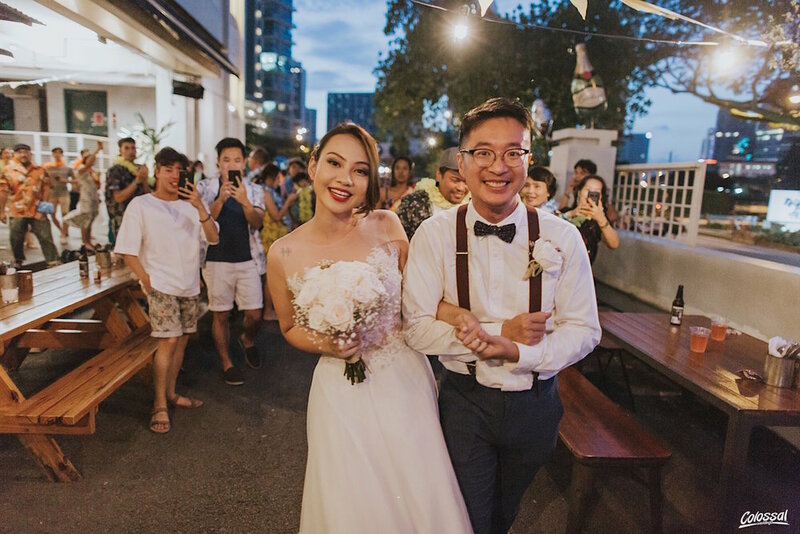 I wore rainbow boots from Dr Martens at my wedding party!" Any memorable moments leading up to your wedding day? "Well our friends were really worried because our wedding party was so chill and really didn't take much to plan. I feel like the little milestones along the way make good memories, like getting our wedding bands together and booking the venue made it feel very real. 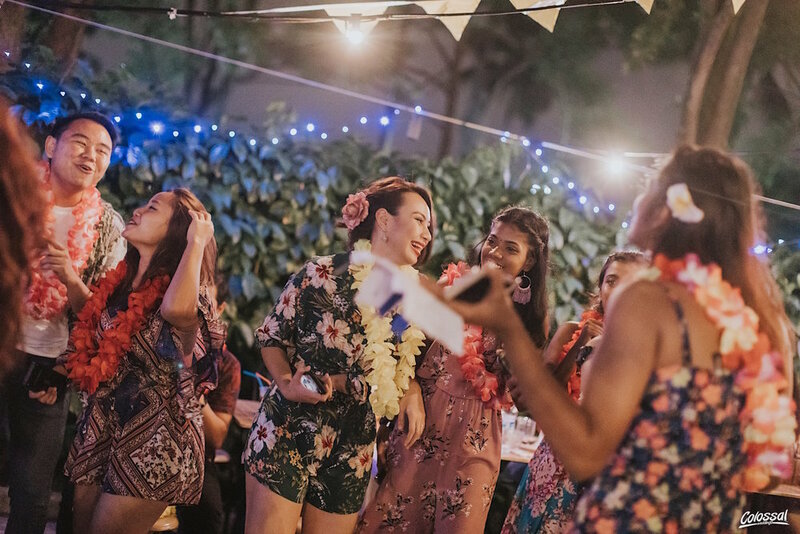 But my forever memory is definitely the night of the party, to see all my relatives and friends dancing together. You don't get to see that often." "We also held a limbo rock contest and gave Salonpas as a prize hahah, hula hoop contest and we had a shortest shorts contest as well. It was a really great night, so many of our guests participated! Everyone was surely entertained." Any wedding advice for soon-to-be-wed couples? "Martin and I are very lucky to have parents (on both sides) who supported our decision for an unconventional party. My aunties, his aunties, uncles and our cousins were all up on their feet and dancing! I would say the best memories come from imperfection and not to sweat it on the small stuff, it always works out!" Event styling/ Decoration: Martin and his friends!